Chef de Cuisine Hervé Rameau of Le Belem at Cap Est Lagoon Resort & Spa in Le François, Martinique provides a taste of the island. At Le Belem restaurant at Cap Est Lagoon Resort & Spa, French Chef Hervé Rameau enticingly combines French technique with the culinary essence of Martinique. Chef Rameau's illustrious career includes training in Paris at Taillevent a 2-star Michelin restaurant, at Lucas Carlton a 3-star Michelin restaurant, and working at La Samana in St. Martin for 4 years before coming to Le Belem at Cap Est Lagoon Resort & Spa, which opened in December 2002. He graciously shares his recipe for Tatin of Goose Liver and Caramelized Yellow Banana with Glazed Shallots and Green Lime with Luxury Experience. Bon Appetit! Method: Roll out the puff pastry and cut it into a 4-inch (10 centimeter) diameter circle. Slice the shallots very thin and sweat them in a pan with butter for approximately 1 hour, stirring them regularly. Peel the limes, and cut the peels into fine julienne pieces. Blanch and glaze them in ½ liter water and white sugar for 45 minutes. Reduce the juice of the poultry stock and the lime peels over low heat. Cut the bananas into large pieces, sauté them in the butter with the sugar cane and caramelize them. Add the glazed shallots and pour everything into a small frying pan (blinis size). Arrange them on top of the circle of puff pastry. Bake in the oven at 350° F (177° C) for 6 minutes. Remove the tart from the oven and place on the serving plate. Cut thick slices of goose liver. Sauté the goose liver in a very warm frying pan without adding any fat. Lightly pat the goose liver with a towel and place on top of the tart. Add a pinch of Fleur de Sel and a ribbon of sauce all around the plate and garnish with some lime peel. 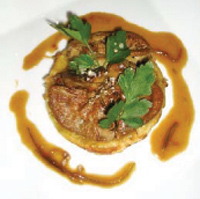 Chef Hervé suggests that you serve a 1998 Chateau de Malle, Sauternes with the Tatin of Goose Liver and Caramelized Yellow Banana with Glazed Shallots and Green Lime. Read other articles on Cap Est Lagoon Resort & Spa in the Destinations, Hotels and Resorts, Restaurants, Chefs' Recipes (French version) and Spas sections. Read other articles on Martinique in the Destinations, Hotels and Resorts, Restaurants, Chefs' Recipes, Fashion, Gastronomy, Events and Liquor Cabinet sections. © August 2006. Luxury Experience. www.LuxuryExperience.com. All rights reserved.